Around that time, nearly 400 smallcaps had touched 52-week lows. Smallcaps was the most ignored asset class. And some of you wanted to know whether you should wait before buying smallcaps. And I was saying - no, buy away. I had written then that market timing is an exercise in vain (something that most people only realise in hindsight). And, I had also shared with you 4 quality smallcaps that I believed were rebound opportunities - that were ripe for investments. Since then, the smallcap index is up 12%. Two of the rebound stocks have moved up and are now well beyond the buy zone (Not to worry - the other two are still great actionable opportunities). That's the thing about smallcaps. I recommend buy action when I see the value in a stock higher than the price at which it is being traded, with no certainty about how soon or late the stock will move up. Sometimes it happens in a few days, and then there are cases where it takes months, or even years. I don't mind waiting. For a value investor, patience is the biggest virtue and you can't go far without it. We have the maximum number of actionable stocks available when fear rules the markets, because it is in these times that one can expect to maximize gains. Speaking of which, right now there is one investing opportunity in an NBFC stock that I am throwing my weight behind. Since the IL&FS default and ensuing liquidity crisis, the stocks in the segment have taken a hit. Where most see crisis, I see a great opportunity in one of the stocks I have recommended in this segment. In fact, I invited the management of this company to speak at this year's Equitymaster Conference. Here, our subscribers got the chance to hear directly from the CEO, and ask him relevant questions. From the kind of feedback that I got from my subscribers, they are as convinced of the potential in the stock, and about quality of the management as I am. This stock is down 38% from my recommendation price, courtesy all the concerns floating about NBFCs. Mind you, most of these concerns do not hold true for this firm, for it has one of the best capital adequacy, asset quality and asset liability management in the industry. The company is at an inflection point in its journey - moving from mainly a corporate lender to becoming one of the biggest in a niche retail segment with very attractive spreads. What I like the best about it is the current management with a strong track record and reputation in the industry. The stock figures in my top stocks to Buy list, but may not remain there for long. Make sure you do not miss the buying opportunity this time. And if you are still waiting for signals, remember, there is no correct timing, only right time to buy stocks. For select small caps, that time is now. PS: Now now now! Richa has been telling you the time to buy is now for weeks... the time is now about to pass. 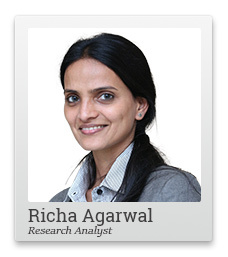 Do not sit on your hands - join Richa and get this super-potential NBFC stock now. Equitymaster requests your view! Post a comment on "This Small Cap Stock Could Offer Triple Digit Gains from its Current Price". Click here! 1 Responses to "This Small Cap Stock Could Offer Triple Digit Gains from its Current Price"